to purchase tickets visit royalfamilyproductions.org or by calling 1.866.811.4111. A scene from LOVE/SICK. Photo by Russ Rowland. 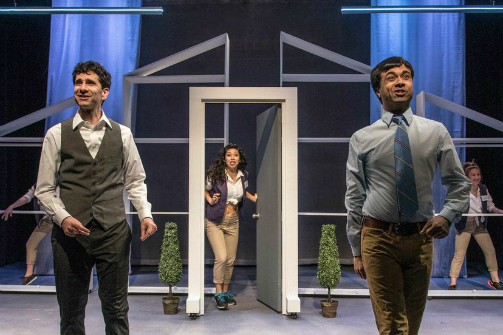 BOTTOM LINE: The premise and themes of this work may not be new, but the comedic performances and laugh-inducing script make this production worth seeing. The concept of Love/Sick, a series of vignettes about the pains of romantic love, is not one that is particularly original (I actually reviewed a show for Theasy in the past with an identical premise and nearly identical title.) However, it is one that works due in part to the energy and skill of the performers as well as the fact that some of the scenes that unfold take a fresh direction on a familiar scenario. Linking the series of stories together is “The Super Center” a big box Walmart type store that seemingly sells everything from birthday cakes to hand guns. In between each scene is a song and dance number about The Super Center (which hints at the coming scene) in which uniformed employees transition the set for the next scene. The aisles of the fluorescent lit store are the setting for the passionate make-out sessions that both begin and conclude the work. In the introductory scene two individuals suffering from “obsessive impulse disorder” (Dee Roscioli and Debargo Sanya) leap upon each other and begin passionately kissing. They write off their actions as the negative symptoms of their disorder, in which they are unable to control strong impulses, but in the end find solace in meeting another individual afflicted by the same problem. In another scene, a gay couple (Sanyal and John Cariani) meet for a date and one confronts the other about the fact that they have been dating for a month but have yet to so much as hold hands. It turns out that his boyfriend suffers from some sort of emotional disorder where his body shuts down when he starts to feel any emotions that might potentially hurt him. This means that when his boyfriend tells him that he loves him he suddenly becomes deaf and when he tries to express similar feelings his tongue stops working and the words just will not come out. The disorders in these two scenes lead to humorous outcomes but also seem to be relevant to the maladies of our current era in which emotional vulnerability has become something to fear and avoid and the rules of courtship are in flux. Marriage is also shown to be a problematic state and in one scene a bored wife (Simone Harrison) informs her husband (Sanyal) that extreme boredom in a marriage can lead to homicide, while in another a wife (Roscioli) celebrates her 35th birthday by asking her husband (Sanyal) why they never got around to having the baby they both said they wanted, and wonders when they are going to finally have the life she was planning on. Playwright John Cariani may not be a known name to you, but surely the title of his most well-known work, Almost Maine, is. While the play was not an immediate hit in New York City, it has gone on to be highly popular, especially outside of the city and has become one of the most produced plays in history. Love/Sick is said to be the darker cousin to Almost Maine as it utilizes a similar tone but is a tad more sardonic with its humor. As billed actor Justin Hagan is suffering from an injury, playwright Cariani has also been filling in as one of the lead actors. As a comedic actor he proves himself to be quite enigmatic and talented. The cast as a whole plays off of each other well and under the guidance of director Chris Henry shows a knack for physical comedy. Debargo Sanya, who has become a recognizable face in off Broadway theater, succeeds in particular, evoking much laughter in each scene. The set design, though minimalist, includes just enough to convey the differing settings of each scene. Love/Sick may not be a work of earth shattering greatness, but it offers plenty of laughter and is engaging from start to finish. Those nursing their own heartbreak and romantic misadventures many surely find commiseration in the script’s pleasingly cynical tone.